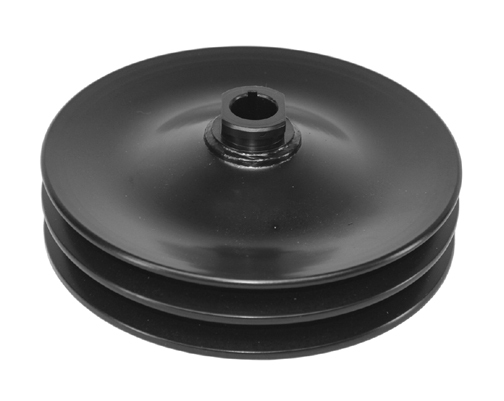 Short water pump - small or big block Chevrolet two groove water pump pulley. Designed for standard passenger car and truck 5/8 water pump shaft applications. Will not work with Corvette water pump. Will also work with 348-409 standard water pump. Outer diameter of pulley measures 6¼. Short water pump - small block Chevrolet two groove crankshaft pulley. Designed for standard passenger car and truck applications. 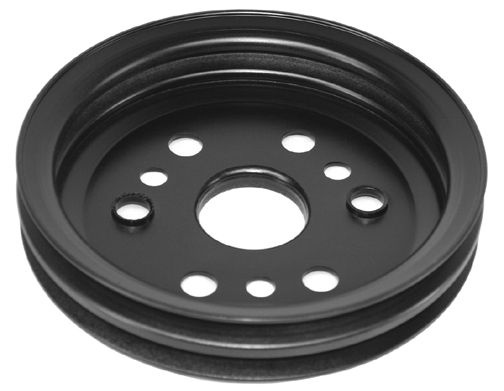 This pulley is also designed to accept an add-on one groove pulley for power steering applications(our Part# 502). Will work with 348-409 Chevrolet engines. Outer diameter of pulley measures 6¾. Short water pump - big block Chevrolet two groove crankshaft pulley. 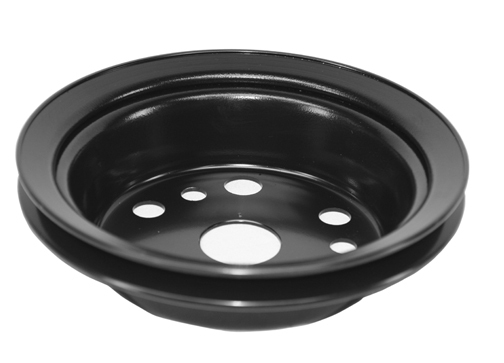 Designed for standard passenger car and truck applications. 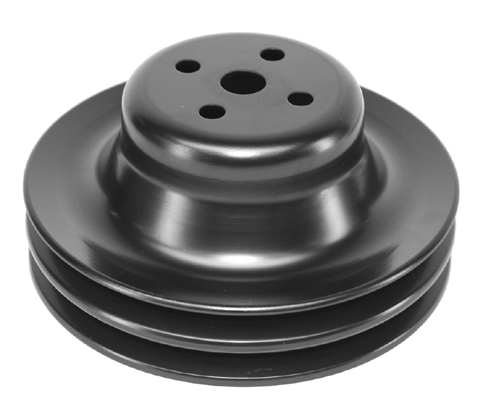 This pulley is also designed to accept an add-on one groove pulley for power steering applications(our Part# 502). Outer diameter of pulley measures 6¾. 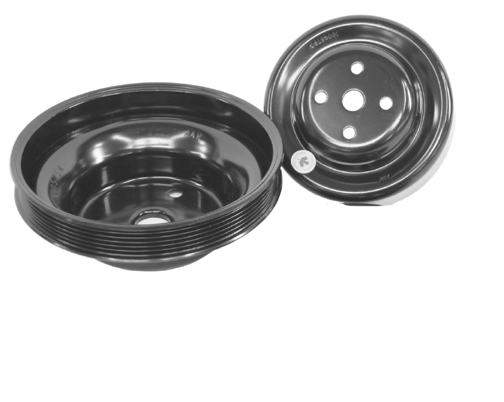 Short water pump - small or big block Chevrolet one groove add-on crankshaft pulley for power steering applications. Designed to fit inside a factory one or two groove crankshaft pulley as well as our part numbers 501 and 501 B pulleys above. Will work with 348-409 Chevrolet engines. Outer diameter of pulley measures 6¾. Two groove (Bolt-On) power steering pump pulley for attached reservoir Saginaw pumps used in 1974 and earlier Chevrolet V-8 applications. These pumps have a 5/8 key-wayed shaft, and require a locking nut for pulley retention. Pulley comes with new locking nut. Outer diameter of pulley measures 5¾. 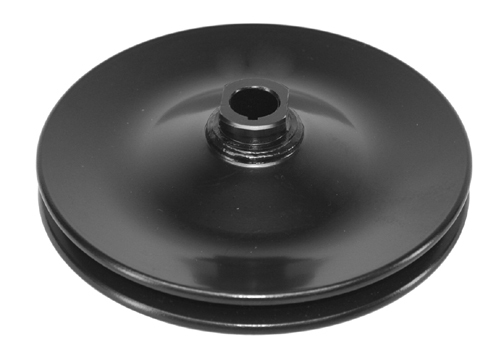 One groove (Bolt-On) power steering pump pulley for attached reservoir Saginaw pumps used in 1974 and earlier Chevrolet V-8 applications. These pumps have a 5/8 key-wayed shaft, and require a locking nut for pulley retention. Pulley comes with new locking nut. Outer diameter of pulley measures 5¾. Same as our part number 507 above, except for the pulley groove position is set back one pulley groove from stock or 5/8 when lining up with the crankshaft pulley. It is in the same goove position as the inner groove of a two groove power steering pump pulley (Our part number 506). 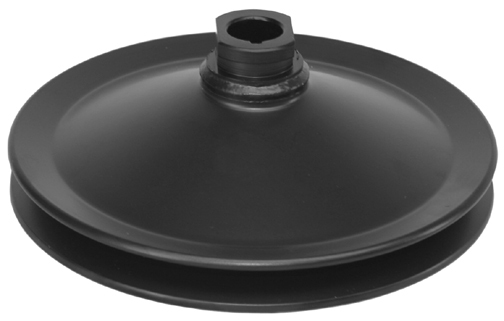 Aluminum one groove (Press-Fit) power steering pump pulley for the Type II saginaw remote reservoir pump. Disigned to work with all Alan Grove Components Type II bracket sets. 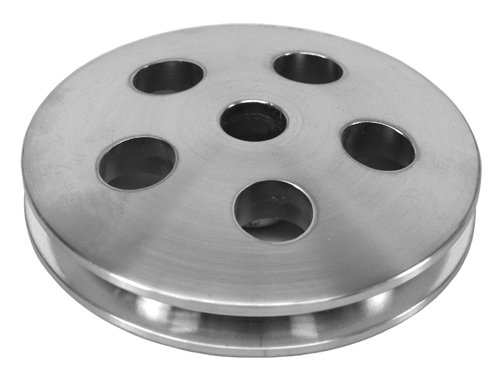 Pulley has a smooth 17mm press-fit shaft. Outer diameter of pulley measures 4 5/8. Small block Chevy - 1988-95 reverse rotation long water pump serpentine pulley set. 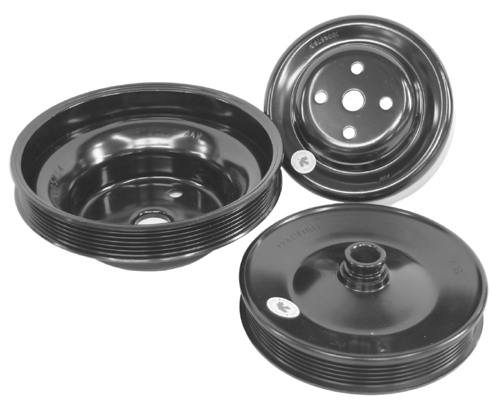 Pulley set includes water pump, crankshaft, power steering and alternator pulleys. For AGC Part#s 305,306,307, 308 and 408L. Same as Part# 510 above except without the power steering pump pulley.